I can't believe what I saw today. 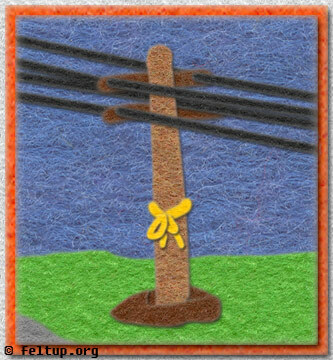 Some one actually had the devotion to tie yellow ribbons on all the utility poles in their town. Long droopy plastic yellow ribbons. They spanned for literally miles. I think I've mentioned my low opinion of those car magnet ribbons, especially since I know lots of them are made in China. I'm not a non-troop supporter (please no hate mail! ), I just think that the yellow ribbon is highly misconceived. The song from which the tradition was derived has nothing to do with going to war or troop support. The ribbon is to signify if his former girl still wants to be with the him after he's gotten out of prison. It's baffling to think of how many hours that person(s) must have spent cutting and tying ribbons. Why not put your effort towards something that actually does support the troops, volunteer or run some sort of donation drive. Plus, it looked totally tacky... but the effort is still commendable. I'm sure most people think I'm a jerk (or other four letter word) for thinking this.